I taught myself to knit when I was a preteen. Both my Grandmothers and mother knitted when they were alive. My Mom had knitted for pleasure. My maternal grandmother raised her own sheep and knitted for her family, including their underwear (long johns). After shearing the sheep she would wash the fleece and remove all dirt. After drying the fleece, she carded it with a drum carder to straighten out the fibres, which prepared them for spinning. Grandma used a walking wheel which my grandfather had built for her. I will try to get a picture of this wheel to post at a later date. All you would need is a few basic carpentry skills to build this economical device. 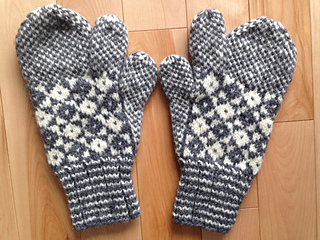 Instead of the traditional double knit pattern, I knit my trigger finger mitts using the method for thrummed socks and mitts. My husband only wears his on really cold days as he says they are too warm. You can order a pair of custom made, one of a kind trigger finger mitts by emailing me at nannys.trunk.of.treasures@gmail.com. Price varies depending on size and choice of materials used.